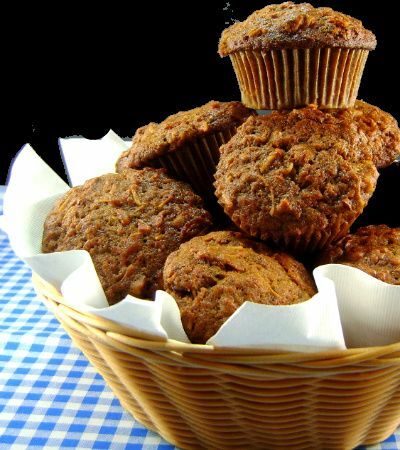 From the kitchen of One Perfect Bite...The original recipe for these muffins was published by Gourmet Magazine in 1991. Ten years later Pam McKinstry's recipe was chosen one of the magazine's 25 favorite recipes from the past 50 years. Since then, many have tried to improve the recipe. While they may have made the muffins a bit healthier by reducing fat and using whole grain flours, the "improved" versions of the muffins do not, in my opinion, match the flavor of the original. A lot goes into these muffins, but they are very easy to prepare and they stay fresh for several days after they've been made. The most irreverent of my children has a special name for any food that can be made or ordered "with everything". As a result, you will occasionally hear references to garbage pizzas, burgers and muffins in my house. I hate it, but what can you do? These muffins escape that designation, but just barely. Adding one more thing to the ingredient list would take it over the top and it, too, would find itself on the "garbage" list. Before that happens let me give you the original recipe. As a point of reference, these muffins are more like an apple cake or pudding then a standard breakfast muffin. They are delicious. Here's how they're made. 1) Position a rack in lower third of the oven and preheat to 350 degrees F. Line standard muffin pans with paper liners. Set aside. 2) Whisk together sugar, flour, cinnamon, baking soda, and salt into a large bowl. Add coconut, raisins, apple, pineapple, carrots, and nuts, and stir to combine. 3) In a separate bowl, whisk eggs with the oil and vanilla. Add to dry ingredients and mix well. 4) Spoon batter into muffin tins, filling to top of each cup. Bake for 35 minutes or until a toothpick inserted into middle comes out clean. Cool muffins in pan for 10 minutes, then turn onto a rack to finish cooling. Yield: 16 muffins. These are my favorite muffins of all times! There's a small cafe near the little town I used to live where I would always go in the morning just to grab onde of those... yummy! Mary, I've been making these for years and they're wonderful! Sometimes I forget about passing on old standard favorites-great idea! just a curiosity ;-) I may have to shop there one day! This is a great recipe--I haven't made it in ages--thanks for the reminder! A very moist looking mix. Yummy! Hmmm...those muffins look so yummy! They look delicious! I have made them many times and now, after seeing this, I will have to bake them again! They are the best and your pics are beautiful! Oh Mary, could you PLEASE bring some over for breakfast? Happy Blue Monday. Wow those muffins are chock full of goodies. They sound delicious. Dropping by to say hello and get one of the mouth watering muffins. I adore these muffins - one of the best of all time. It makes waking up early a treat! Anything that contains pineapple, carrots and apples is a treasure! What a way to start the day. Mmmm... I would love one of those muffins with my coffee right now! Another delicious muffins that are mouth watering. A muffin and a cup of coffee are the perfect start of the day. Lovely photo, Mary. Alessandra, muffin tins here have 12 cups. I use 2 pans to make these and fill the empty cups with water. We also have something called Texas tins. These are large 6 cup pans that make giant cupcakes or muffins. THey look delicious - but think I will leave the conconut out. Hope you have a great day. these sound amazing. 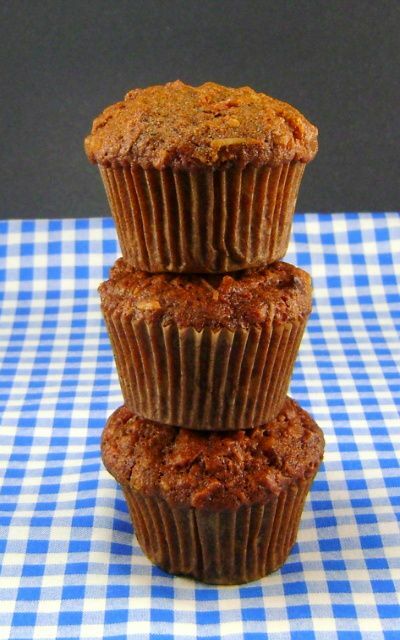 i am in search of the perfect bran muffin over at http://incrediblecrunchyflavor.com, so i think i'll have to modify this recipe a little and give it a try! Great muffins to start the week! Oh yum! You had me at "apple cake muffins". Mary, it would be a glorious morning to awake to this great muffin. Back during my Coffee Chef days, if I did not make Morning Glory Muffins, I heard about from some of my most loyal customers. Your recipe here is very similar, so I know how good it really is. I've heard these are great, but I've never tried them! What a treat! These muffins not only look glorious but they sound glorious too. questi muffin devono essere golosissimi!! complimenti! ciao! Any way you can ship some over? :) They look fantastic! Those look so wonderful! Happy Blue Monday! They certainly sound good. The carrot will keep them really moist, thanks for passing on this recipe. Lol at the garbage food! I love the ingredient list!carrots, and apples,raisins.... These muffins are perfect for hosting a brunch! These are my favorite muffins too. I've never made them myself but I just might try them with this recipe. They look exactly like the kind I like. An absolute favorite of me and my friends whom I love enough to share these glorious muffins with! They are filled with so many goodies - they look terrific Mary. Oh my gosh Mary, this looks delicious. We are on a diabetic diet. My dh was just told his numbers have gone to diabetes. He is not convinced. I have to be sure the right food is cooked for him. I could lose a few pounds too. I will just have to drool a bit. How is your shoulder? I am finally not in so much pain. The MRI showed no tears. Arthritis and tendons inflamed only. I am relieved. I just saw a similar recipe in Everyday Food. The addition of pineapple sounds the best to me - I better try this! I loved the recipe and wanted to get in touch with incrediblecrunchyflavor but couldn't !!!!!!!!!!!!!!!!!!!!!!!! I wanted to ask her about using Almond Flour 25 to 50% in a regular recipe instead of regular flour and if it would cut down on the carbs? I tried wordpress.com but it was not an acceptable address, as well as her's, etc. I would love to know. Thanks so much! Caroline, I have no idea if the substitutions you want to make will work. She has a website http://incrediblecrunchyflavor.wordpress.com/ Why not try her there? Happy Blue Monday :) the muffins look delicious! Mary, trust me, I did that and every other way, and it would not go through on AOL or Windows Live!~~I certainly did try before resorting to blogging on your site. I am sorry to have caused you concern. Sshe blogged to you she was going to try to make it less fat or carbs, and ask for people wanting or needing her to experiment to contact her, so that is how I got her name, Thanks anyway. These muffins sound so good that I might just try to pass them off as frostingless cupcakes to my kids! One of the best muffins EVER! I don't know how you do it, but your photos are almost as good as the real thing! Now, I'm hungry for a Morning Glory Muffin! DEE-licious! Sounds more like dessert than breakfast to me with that luscious list of ingredients! And I never really understood why people feel the need to take something wonderful and reduce the fat or make it "healthier". I mean, is anyone going to eat 35 of these muffins in one sitting? Then keep it real! Look delicious! Those ingredients sounds so tempting! Must be super yummilicious. I've been wanting to make morning glory muffins for ages but just never seem to remember to get the ingredients at the store. I just found your recipe in my out-of-control bookmarks folder; Perhaps it's a sign to make them this weekend! Thanks for sharing.